The ten finalists for the 2016 Jim Baen Memorial Short Story Award have been announced. The top three winners will be notified by March 22 and will be honored at the 2016 International Space Development Conference in San Juan, Puerto Rico, May 18-22, 2016. Baen Books has announced the top ten finalists for the 2016 Jim Baen Memorial Short Story Award, a contest held each year for of all levels of experience. The Grand Prize will be presented at the 2016 International Space Development Conference in San Juan, Puerto Rico, May 18-22, 2016. The contest occurs annually and looks for stories that demonstrate the positive aspects of space exploration and discovery. Over the years, the contest has developed an international character. In addition to the United States, entrants have hailed from Sweden, the United Kingdom, Australia, Canada, France, Algeria, Switzerland, New Zealand, Spain, and Morocco. 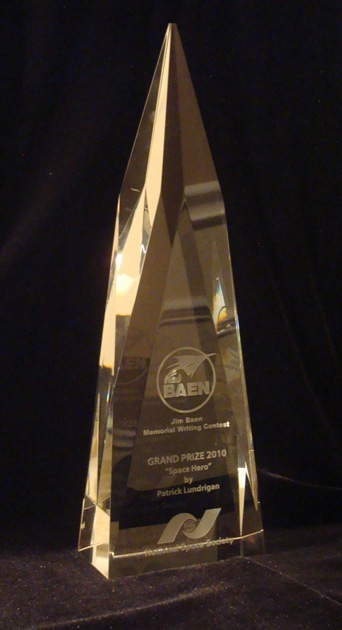 This entry was posted in Awards and tagged Jim Baen Memorial Short Story Contest by Mike Glyer. Bookmark the permalink.